Optical spectrum analyzers are laboratory instruments that measure the magnitude and frequency of an input signal. These precision instruments are used in test labs to monitor and detect anomalies in laser and LED devices. In particular, these analyzers are extensively used to check spectral purity and the distribution of power in such devices as well as determine specific transmission characteristics in optical devices. In recent years, optical spectrum analyzers have found the most widespread use in monitoring fiber-optic communication systems. If your test applications demand the use of optical spectrum analyzers to measure and maintain the quality of various devices, then you can consider refurbished models by Ando and Yokogawa which are reliable and live up to the mark. The Ando AQ6317C optical spectrum analyzer is a supremely effective blend of powerful technology and an extremely intuitive and user-friendly interface that lets you carry out advanced analytical jobs effortlessly. The AQ6317C spectrum analyzer maintains a consistently high degree of accuracy of +/-0.1 nm throughout the entire range of wavelength, from 600 to 1750 nm. It has an impressive accuracy level of +/-0.02 to +/-0.04 nm for the wavelength range between 1450 to 1620 nm. This is a definite and significant improvement from its predecessor. 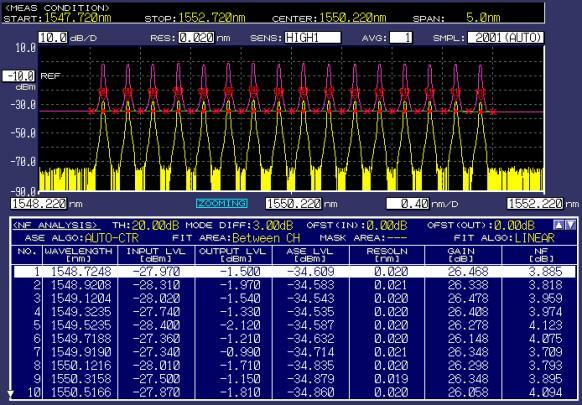 The S-band calibration is also a noteworthy addition to the Ando version of this optical spectrum analyzer. The Ando AQ6317C has a high wavelength linearity of +/-0.01 nm at C-band and +/-0.02 nm for L and S bands. It is more powerful and sensitive than earlier makes with a wavelength resolution of up to 15 pm and a wide dynamic range. This is an ideal instrument to own given the advent of giga-bit Ethernet and CWDM technologies in the field of optical communications, which has seen a dramatic expansion in the wavelength band. 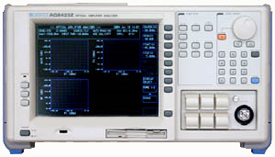 The Yokogawa AQ6370B model of optical spectrum analyzer is a matchless performer in its class. It provides a high wavelength resolution of up to 0.02 nm and a high dynamic range of up to 78 dB. The analyzer is fitted with a sophisticated monochromator that achieves these enviable figures and also lets you separate and analyze spectral signals that are in close proximity to each other. The high dynamic range is achieved by the instrument’s unique capability to lessen the impact of stray-light in a powerful optical signal. Faster electrical circuits and effective noise reduction capacities enable the AQ6370B to maintain accuracy even when working with steep spectrum from DWDM or DFB-LD signals or the common low-powered ones from broadband sources. In an age where speed is the be-all and end-all of communication, the AQ6370B with lightning fast Ethernet and GP-IB interfaces is just the ideal testing tool. Both the Ando 6317C and the Yokogawa AQ6370B excel over their counterparts by being easy to operate and making it easy to handle and store for future reference the mountains of data they generate. Refurbished makes of the Ando 6317C and the Yokogawa AQ6370B optical spectrum analyzers fulfill the stringent demands of today’s fast and complex communication environment and which set the bar higher. Today Ando and Yokogawa have merged into the same company, one of the largest manufacturers in the T&M world.